A 30's vintage two door sedan hotrod at a local auto parts store. Thanks for the critique Brian,I have uploaded another for comparison.I think you are right about the distraction. 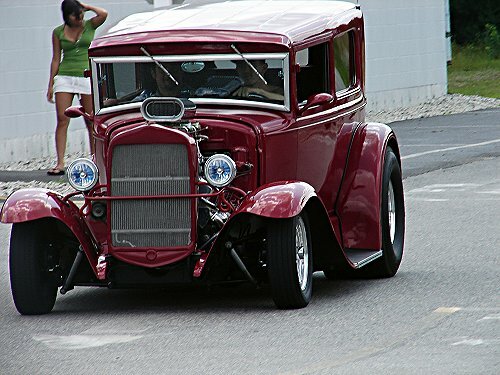 I love antique cars like this one. The girl in the background is a little bit of a distraction. I wonder what it would look like if you cloned her out of the image. I really like the car's red color - especially with the blue in the headlights. Thanks Alan,I'm glad you enjoyed it. Nice shot of the cool hotrod, and the girl looks pretty nice too LOL.. Thanks for the coment Don,I'm glad you enjoyed it.I almost missed this one,as he was just pulling out.